High-quality new-build offices at One Central Square, Cardiff required washroom facilities that reflected the design aspirations of the new building work. 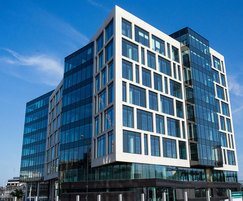 A regeneration scheme in Cardiff Central Square includes over a million square feet of new office, retail and residential space, providing a huge boost for the economy of the Cardiff Capital Region and creating a Gateway to the Capital of Wales. High-quality offices in Wood Street at One Central Square required washroom facilities that reflected the design aspirations of the build. There needed to be sufficient amenities for a large number of staff. These needed to be of ample size and to mirror the modern design of the building’s exterior. The architects responsible for the specification worked closely with Ideal Standard’s dedicated team of experts to choose products that would meet the demands of their specific criteria. Every washroom contains wash troughs with Sensorflow 21 taps and soap dispensers and Jasper Morrison designed Ideal Standard urinals with sensor flush. All WCs specified in the office development feature the revolutionary AquaBlade™ technology. In fact, the offices in Wood Street are the first commercial project in the UK to specify this ground-breaking flushing technology as part of the Tonic II product selections installed at One Central Square. 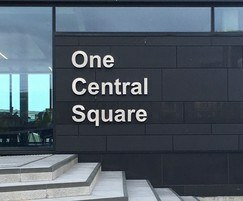 Steve Borley of CMB Engineering said: “One Central Square is the 1st phase an exciting development which will include the new BBC Headquarters in Wales and landmark transport hub, which will transform Cardiff city centre and provide a leading business and media district within the Capital. It aims to become a place defined by excellence in design, in quality and in diversity of offer with the vision from leading Cardiff Developer Rightarces Property Company. 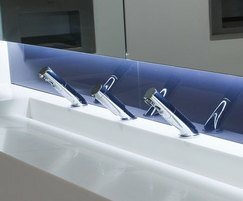 It was important to reflect these values to provide a contemporary bathroom solution for this modern and high quality development – with a bold, clean design throughout every washroom, including accessible cubicles, ensured every user would feel comfortable using the office facilities and contribute a happier more motivated workforce." 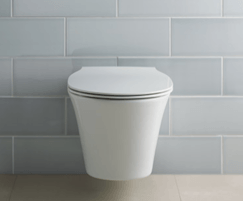 Ideal Standard is delighted that One Central Square is the first commercial project in the UK to feature the revolutionary AquaBlade™ toilet technology, which offers a superior flush performance and out-performs all existing toilets in terms of hygiene.